Originally posted: October 14, 2017 . Last modified: October 31, 2018 . All the goodness of a loaded baked potato in a creamy, silky smooth soup. Loaded Baked Potato Soup is warm, hearty, and completely satisfying. Fall is here! Fall is here! Actually, it’s been winter across most of the country for several weeks. It’s a different story here in Florida. I thought Fall skipped us all together, but then it happened. Last week, the temperatures dropped to the 60s and 70s at night. Regardless of where you live, Fall is the perfect time of year for yummy, warm, hearty foods. That means lots of soups, stews, gravies, and dishes to keep you warm. I wanted to make a creamy but light soup. Something warm, cheesy, and silky smooth. My first thought was to make a French Onion Soup. However, my son has been asking for potato soup. It’s creamy, smooth, and full of baked potato goodness. Loaded Baked Potato Soup was a perfect choice. This soup tastes just like a loaded baked potato but in a rich, smooth form. It’s easy to make, and the consistency can be changed to suit your preference. 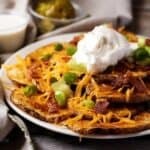 Some people like big potato pieces, bacon, and melted cheese in the soup while others like the bacon and cheese on top. I’ve even heard some people load it up with celery, onions, and carrots. The recipe is so versatile that you can’t possibly go wrong. I chose to go very simple and follow the “less is best” philosophy. This loaded baked potato soup is filled with small bits of potatoes and cheese and is topped with crunchy bacon, more shredded cheese, and green onions. I’ve found that using a hand blender or immersion blender works well if you want a thicker, creamier soup. The blender helps break down the potatoes some and mix them with the milk and cheese. If you like a chunkier soup, skip the blender process and leave the potatoes in larger pieces. 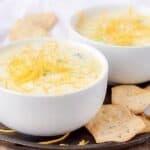 Either way, this creamy loaded potato soup is super satisfying and simple to make. Add this to a half sandwich for a quick and easy lunch on a cold day. Love bacon and cheese? So do we! Here are a couple of our other bacon and cheese recipes: Chicken Bacon Ranch Pasta Salad and Grown Up Grilled Cheese. All the goodness of a loaded baked potato in a creamy, silky smooth soup. Warm, hearty, and completely satisfying. Cook bacon and chop into bite-sized pieces. Set aside. Melt butter in large stockpot over medium heat. Add flour and whisk until combined. The mixture will turn light brown. Continue to whisk for 2-3 minutes. Slowly add the milk and chicken broth to the flour mixture. Whisk until well combined. Add the potatoes and bring to a boil; reduce heat to a simmer and allow to cook until fork tender (about 15 minutes). Take off the heat and slowly stir in the heavy cream, sour cream, cheese, salt and pepper. Top with bacon, green onions and additional cheese. Ahaha you crack me up. I’ve never known anyone to cheer for winter’s arrival 🙂 But I do get the excitement about all these hearty comfy dishes. Like this one! I love rich, creamy soups. Especially ones with cheese! Yum.